BS TESTS has been awfully quiet until this most recent injustice awakened the Bull into a snarling mess of disappointment. 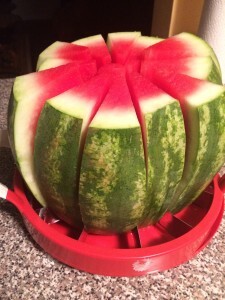 This is a Watermelon Slicer that was purchased at Sam’s Club last summer and was never used until recently. Currently it is not available and hopefully that will save you from making the mistake of throwing away ten plus dollars. First, the instructions suggest cutting both ends of the melon. 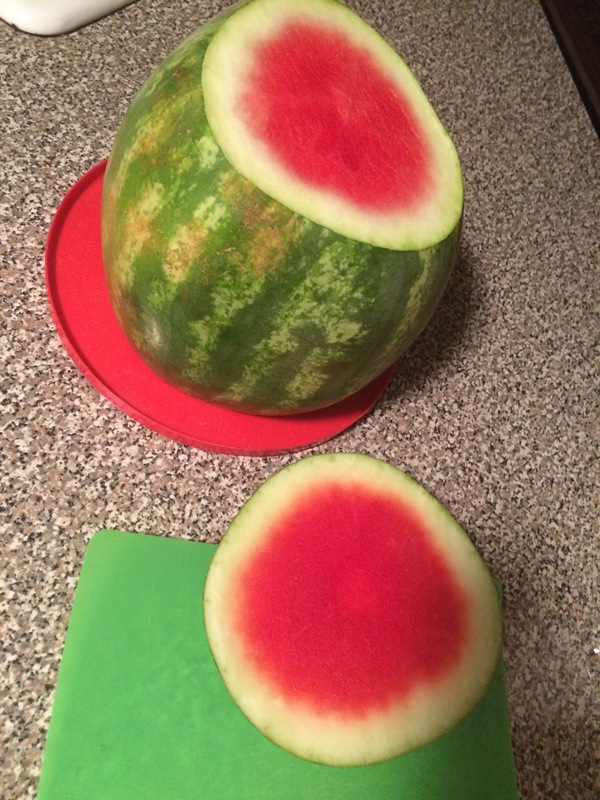 I guess without the old watermelon cutting knife that seem to work just fine, step one would not be possible. This may also require a cutting board and lots of paper towels. The flatter the end cut, we have learned the better it works. Step 2: Place it on its circular juice catching tray, which oddly has a whole in the center so that the maximum amount of sticky juice squirts through it, onto your counter top. Step 3: Press the blades on top of the cut melon and push with as much force as you can humanly muster. This may not be enough. I can assure you this is not something the average Mom can manage without inverting into a complete handstand over the fruity prey. Here is what it looks like after I pulled a hamstring and blew out my elbow. I know it looks very pretty and inviting but the slices are so thick an adult mouth is stretched trying to eat just one slice. I guess you could break out the old watermelon knife and slice each wedge in half, twice for the children. Although this was not pleasurable the first try, to be fair we went again for a second time. The blades were bent and in applying only enough force to get through the first inch or so the handle snapped and cracked making gripping the top almost impossible. Attempt 3 and 4 fared about the same. This product gets the lowest rating of 1 Bull for watermelon. I would have tried other melons or even pineapple, but with a broken handle I will stick with my melon and paring knives.